Check out the ICSS Pinterest Boards! During this intensive, three day seminar, teachers will begin an investigation into contemporary genocides, such as Armenia, Cambodia, Rwanda, Syria, and Myanmar (the Rohingya). The course will include multi-media presentations, guest speakers and will draw interdisciplinary connections that align with state and national standards. Explore concepts such as prejudice, discrimination, stereotyping, racism, responses to genocide, prevention, and justice. Drew Beiter, Co-founder, Educators Institute for Human Rights and Education Director, IAMSYRIA and Teaching About North Korea. Kate Weckesser English, Executive Director, Educators Institute for Human Rights. Immaculee Mukantaganira, Tutsi Survivor of 1994 Rwandan Genocide. Christopher Dearing worked with the Documentation Center of Cambodia (DC-Cam)/ Sleuk Rith Institute (SRI) as an independent international advisor, educational consultant, and researcher since 2008. He is the co-author of Teaching the History of Democratic Kampuchea (1975-1979): Teacher's Guidebook and The Final Days of the Khmer Rouge: A Community History of Anlong Veng. Mr. Dearing is attending this conference in his personal capacity as a genocide education consultant and his views do not represent the views of his current or prior employers, clients, or associates. Help us find the 2019 National History Teacher of the Year! The deadline is fast approaching to place your 2019 National History Teacher of the Year nomination. Each year we recognize first-rate K-12 teachers who find creative ways to bring history to life in their classrooms. Winners are selected from each state and US territory, and become finalists for the national award. The national winner receives $10,000 and is honored at a ceremony in New York City. Do you know an outstanding candidate for the award? Make your nomination by March 31 here. Scribes of the Cairo Geniza is an international collaboration led by the Penn Libraries in partnership with universities, libraries, and scholars to sort and transcribe thousands of medieval fragments. A geniza is a storeroom or repository for old, used, and damaged sacred texts in the Jewish tradition. The Cairo Geniza (whose contents mostly date from the 10th-13th centuries CE) is an important source for learning about the social, economic, political, and religious lives of Jews and other inhabitants of the Mediterranean world. Hidden for centuries in an attic in Cairo, over 300,000 fragments of pre-modern and medieval Jewish texts—from everyday receipts to biblical works—have yet to be fully deciphered. Scholars who study these texts come away with a transformed sense of the history of the region, and we hope you do too! This is your chance to work with others to unlock the secrets of one of the greatest archives of the Middle Ages! In the first step of the project, volunteers sort fragmentsinto Hebrew or Arabic script. In the second step, volunteers transcribe easy-to-read Hebrew and Arabic fragments. Zooniverse designed an interface that allows someone with no experience in these languages to transcribe fragments. Everyone can try their hand with the #genizascribes! Help us transcribe these fragments from the Cairo Geniza at scribesofthecairogeniza.org. You can also join us on the Talk boards to ask questions, discuss what you’re seeing, and be a part of the community. Come learn the history of everyday lives of medieval Jews, Christians, and Muslims! Scribes of the Cairo Geniza partners include the University of Pennsylvania Libraries, the Princeton Geniza Lab, the e-Lijah Lab and the Centre for Interdisciplinary Research of the Cairo Genizah at the University of Haifa, the Library of the Jewish Theological Seminary, the Genizah Research Unit at Cambridge University Library, The University of Manchester Library, the Bodleian Libraries at University of Oxford, and the Zooniverse community. Join us for a summer week in New England to learn how the newly independent United States rose to become the world's leading industrial power. Description: Investigate the richly resourced history of invention at the Springfield Armory in the 19th century. Experience well-interpreted, hands-on sites and study a compelling variety of maps, letters, business records, paintings, manufacturing products, tools, and more. Teachers will contrast distinct ideologies and strategies for industrial development, and consider the impacts of industrial development on workers, communities, the environment, and culture. A team of historians focus on the enormous economic, social, and political changes in America from the Revolution to the early 20th Century. Seasoned teacher educators will guide a well-honed process of translating rich intellectual resources to the classroom. Lesson development will emphasize inquiry, work with primary sources, and historical thinking skills. Parkland, Florida survivor David Hogg discusses solutions to community violence. Senseless violence plagues communities across the country, including in Chicago, and at times it can seem unstoppable. In this conversation, activists working at the local and national levels will discuss the challenges they face and the strategies they use to promote peace. Parkland, Florida school shooting survivor David Hogg, peace activist Henry Cervantes, and founder of the advocacy group Sisterhood Gwen Baxter, will explore the causes of and solutions to community violence. Hear grassroots strategies to make a positive impact in your own backyard. Program moderated by Laura Washington of the Chicago Sun-Times and ABC-7. Reservations required. Please note that this program is taking place at New Trier Township High School Northfield. This one-day workshop will explore the transatlantic slave trade and its legacies, using the “Purchased Lives” exhibit at the IHMEC as its foundation. In this workshop, through resources and teaching strategies, Facing History will support educators (and their students) in exploring this difficult history and its legacies today. Using sources from Illinois Holocaust Museum’s special exhibition Purchased Lives, Facing History will look at themes of identity and belonging, investigating the origins of concepts of race, and how flawed assumptions led to justification for inhumane treatment and enslavement of others. ​With emphases on both civic engagement and decision-making, we will consider choices made by both perpetrators of injustice, as well as those who resisted those injustices. Though legal slavery ended with the 13th Amendment in 1865, we consider the legacies during the Reconstruction Era and beyond, and how four million formerly enslaved people grappled with freedom, and the United States sought to practice a more inclusive, interracial democracy. Looking to today, we consider how the legacies of these histories impact our lives, and the choices we make. ​Join us for this webinar hosted by staff from the European Union (EU) featuring educators who have successfully incorporated EU topics into their U.S. courses. You will learn about curriculum resources available for teaching the EU, and tips to implement these learning tools in your classroom! This webinar will provide you with the following tools and resources. Registration is limited. Sign-up now! Regarded as one of the most successful peace projects in history, the EU is an instrumental part of modern international relations. As such, knowledge of the EU, its institutions and its policies, can be an important component to any high school social studies lesson, from social studies to economics to government and geography. Immerse yourself in the practice of teaching with primary sources from the unparalleled collections of Library of Congress. Held at the Library of Congress in Washington, D.C., our Summer Teacher Institutes provide educators of all disciplines with resources and strategies to effectively integrate primary sources into K-12 classroom teaching. Each session will focus on pedagogy, with an emphasis on supporting student engagement, critical thinking, and construction of knowledge. While practicing these teaching strategies, attendees will explore some of the millions of digitized historical artifacts and documents available in the Library’s collections. They will also conduct research to identify primary sources and develop an activity related to their classroom content. The Library of Congress Summer Teacher Institutes are appropriate for K-12 educators across many disciplines, including: Social Studies/History, English Language Arts, Science, Art, Music, or any other educators who feel that primary sources could be used with their curricula. Librarians and Curriculum/Professional Development specialists are also encouraged to apply. ​Institute and instructional materials are provided at no cost. Participants will be responsible for transportation to and from Washington, D.C., and any required overnight accommodations. Applications for the Summer Teacher Institutes are due March 10, 2019 and require a letter of recommendation. Read more and apply now ! This multi-day workshop is intended especially for K-12 Library / Media Specialists. Over the 2 ½ day, hands-on session, Library of Congress education specialists will model strategies for using primary sources to engage students, build critical thinking skills, and construct knowledge, with an emphasis on supporting inquiry and research. Participants will reflect on and discuss how these strategies apply to their school libraries, considering various subject areas. While the emphasis is on learning and applying teaching strategies, participants also have opportunities to meet experts from the Library and research in the Library's reading rooms. The session will take place from June 19 – June 21, 2019. Institute and instructional materials are provided at no cost. Participants will be responsible for transportation to and from Washington, D.C., and any required overnight accommodations. Applications are due February 22, 2019 and require a letter of recommendation. Read more and apply now ! Please contact teachinglcsummer@loc.gov with any questions. Searching for professional development experiences this summer? Consider participating in one of C-SPAN Classroom's programs for educators in July 2019. More information regarding the following opportunities can be found on our Teacher Opportunities page. C-SPAN's annual Teacher Fellowship program invites three teachers from across the country to join us in our offices in Washington, DC. The Fellows will spend four weeks during July collaborating with our Education Department to develop new teaching materials using C-SPAN resources. Each Fellow receives an award valued at $7,000 which includes housing and travel expenses. Applicants should have familiarity with C-SPAN's programs and be able to demonstrate their successful integration of C-SPAN's programming and lessons into their classrooms. Applications must be received by Friday, March 1, 2019. This July C-SPAN will host two conferences for middle and high school teachers. Each conference is a day-and-a-half long and will be held at C-SPAN's offices in Washington, DC. Airfare to and from Washington, two nights' hotel stay, and meals during the conference are all provided by C-SPAN. The conferences will bring middle and high school educators (grades 6-12) to Washington from across the country. Participants will learn about C-SPAN and our online resources, as well as how to better integrate these materials into their classroom. If you have not attended one of our previous conferences, and you are interested in learning more about the free resources that C-SPAN provides for students and teachers, we invite you to apply to attend one of our conferences. Conference applications must be received no later than Friday, April 5. 30 educators for each conference will be selected and notified by Friday, April 19. The Advanced Placement® Teacher Training Institute (APTTI) provides comprehensive preparation for developing and teaching an AP® course. APTTI takes place June 25-28, 2019 at the University of Iowa’s Belin-Blank Center for Gifted Education and Talent Development. Each workshop includes: preparation of course syllabi and lesson plans; examples of classroom materials applicable to the particular AP® subject area; and preparation for the new College Board Audit, required for every AP teacher. The AP Teacher Training Institute is designed for teachers who want to learn to teach AP courses in one of the content areas, current AP® teachers, and educators who wish to strengthen the core curriculum. Courses offered in 2019 include: AP Biology, AP Calculus AB, AP Chemistry, AP English Literature & Composition, AP Physics 1, and AP U.S. History. Scholarships to help cover the cost of participation are available through the College Board and through the Belin-Blank Center. For more information, visit www.belinblank.org/aptti or email aptti@belinblank.org. Registration opens January 16. "I feel like this program had a direct impact on high school students via me as their teacher...I am more confident in the material and the course/text structure. My experience as an AP teacher has been much more successful than it would have been without an APTTI." The Gilder Lehrman Institute of American History is seeking nominations for the 2019 National History Teacher of the Year. Each year we recognize first-rate K-12 teachers who find creative ways to bring history alive in their classrooms. Winners are selected from each state and US territory, and become finalists for the national award. The deadline for 2019 nominations is March 31, 2019. Learn more. The award-winning MASTERPIECE series on PBS, known for its outstanding interpretations of classic literature, also offers compelling historical dramas. A Historical Drama Collection on PBS LearningMedia provides educators with new and exciting ways to teach history. Along with videos from the series, resources include background information, discussion questions, activities, and research assignments that help students explore and understand historical events, people, and places. Grades 9-12. See attached flyer. History's 2019 Teacher Seminars is now open. Held at colleges and historic sites across the US and abroad, these weeklong seminars offer K-12 teachers daily programs with America’s leading historians, visits to local historic sites, and hands-on work with primary sources. Teacher Seminars are open exclusively to teachers in our Affiliate School Program. Not enrolled in our Affiliate School Program (it's free!) or not sure if you are? Click here. Looking for a fun yet challenging project-based learning opportunity for your students? 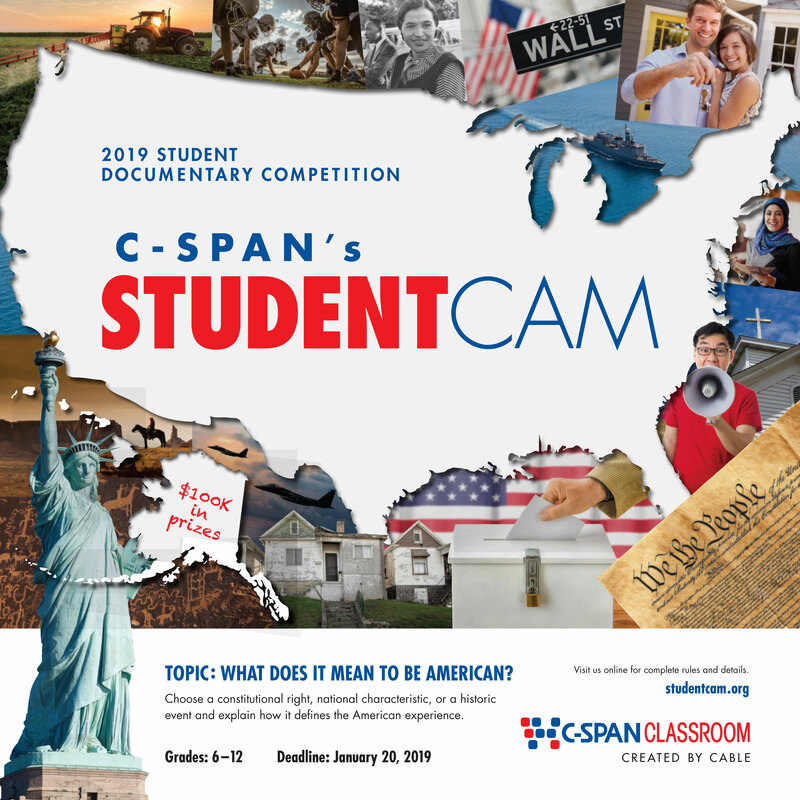 Consider assigning StudentCam, C-SPAN's annual video documentary competition! "WHAT DOES IT MEAN TO BE AMERICAN?" Choose a constitutional right, national characteristic, or historic event and explain how it defines the American experience. Student videos should evaluate how this right, characteristic or event is upheld in our society, or challenged by current events. Rights or characteristics may include aspects of democracy, opportunity, liberty, justice, equality, diversity, unity, individualism, other rights, guiding principles, or shared values. Students may compete individually, or in teams of either 2 or 3 members. Entries must thoroughly explore a variety of viewpoints related to their chosen topic. Documentaries must contain supporting C-SPAN video clips. Students must submit their entry form and video by January 20, 2019. C-SPAN awards a total of $100,000 in cash prizes! Students compete for a chance to win one of 150 prizes. Teachers also have the opportunity to win one of 53 Faculty Advisor prizes. Never participated before, or concerned with how to introduce the project to your students? Check out our updated Teacher Tips page for ideas like our introductory research guide that will help your students through the process of planning and creating their video. You will find a complete list of competition rules and documentary requirements, along with links to view past winning videos at studentcam.org. Teachers, if you haven't already requested copies of our poster and would like to receive a FREE printed version of our 18"x 18" poster to display in your classroom, please complete this Google form with your preferred postal address and the number of posters you would like for us to send. Posters will be mailed the week of September 17. Students share a photograph from the production of their StudentCam documentary on social media. Students may post to Twitter, Facebook, Instagram, or a Snapchat account - upload a photo, tell us about it, and include the hashtag #StudentCam2019. Students must submit their photo by the main competition deadline on Sunday, January 20, 2019. Five $100 prizes to be awarded in March 2019. To be eligible, students must also enter a documentary in this year's StudentCam competition but the documentary does not have to be one of the winning videos in order to win a prize in the "Behind the Scenes" contest. The annual Conference on Illinois History is scheduled for October 4-5, 2018, at the Abraham Lincoln Presidential Library in downtown Springfield and is the state's largest meeting devoted to the history of the Prairie State. The conference includes sessions that feature topics such as Abraham Lincoln, archaeology, Civil War, digital resources, early statehood, immigrations, museums, politics, race and popular culture. The mid-day presentation on Thursday is a roundtable discussion on Illinois Bicentennial Exhibits and will include speakers from prominent state museums and archives. On Friday Frank Cicero Jr. author ofCreating the Land of Lincoln: The History and Constitutions of Illinois, 1778-1870,describes the events of April 1818 that shaped the State of Illinois. Teachers will benefit from workshops on a variety of topics. TEACHERS: To receive CPDUs for the conference, teachers MUST have their Educator Identification Number when signing in at the conference. If you have questions, contact the Education Department at 217-558-8935. On-line registration available at www.presidentlincoln.illinois.gov (click on “special events tickets”). $1,000 to fund your dream park experience. The deadline for entries is Thursday, February 14, 2019​. Winners will be announced on the website Thursday, March 7, 2019​. Population Education is excited to announce that registration is open for our fall 2018 online professional development course for science and social studies educators of grades 6-12! The eight-week course runs from October 15 – December 7, 2018. Discover student-centered learning strategies that use contemporary issues and real-world data to examine the social and environmental impacts of human population and engage in meaningful dialogue with teachers across the world. The course is asynchronous, which means students can work at their own leisure and pace. There are weekly discussion boards and journals, and a final project, all built to provide participants with meaningful feedback and materials to use within their own educational setting. Choose to earn 3 graduate credits from Adams State University or 45 professional development clock hours (4.5 CEUs) for completing the full eight weeks. Sometimes Big Questions don’t direct learning; they emerge from it. Lost in thought and feelings of despair over the latest tragedy in Florida, I decided to ditch my regularly scheduled government programming and opt instead to hold a congressional hearing simulation on gun control. My classroom will become the Senate Judiciary Committee considering a bill called the Concealed Carry Reciprocity Act. This bill passed the House of Representatives in the fall and is slated for debate in the Senate this spring. In a nutshell, the bill says that any person from a state which has legalized concealed carry can travel into any state which has outlawed the practice. Essentially then, should this bill become law, a person’s right to concealed carry would have to be honored by all 50 states. Students assume the roles of actual Senate Judiciary Committee members who question other students who are playing the role of interest group representatives giving testimony on their positions for and against the bill. With this latest tragedy fresh in the minds of legislators, the chances of this bill passing the Senate are slim. Yet, this activity is a valuable chance to explore why it is so hard for our society to agree on gun issues. Also, this is a golden opportunity to dive deeper into how all aspects of our government work together to try to address problems. What about the Big Questions? After the simulation is over, each student will generate a Big Question about the gun issue which emerged as a result of what they learned during the simulation. It’s hard to predict exactly what the students will want to ask but I’m confident the questions will lend fresh perspectives on an issue whose resolution is long overdue. In the next post I will share some of their Big Questions! The Illinois Trial Team is a highly competitive collegiate mock trial team representing the University of Illinois at Urbana-Champaign. Having competed in the national collegiate mock trial tournament this past year, the team is composed of some of the top competitors in the collegiate mock trial circuit, and is coached by real attorneys and law school faculty alike. The team is currently in the process of developing a high school mock trial clinic aimed at giving Illinois competitors the opportunity to learn the skills and techniques which have led to our team’s success, including various tournament wins, attorney awards, and witness awards. This year, we plan on holding a reduced fee pilot program in preparation for a larger clinic next year. We are looking to receive feedback which will help shape our program, as well as gauge interest. If you are interested, please fill out the Google Form below. Any other questions regarding the program can be addressed to Vanessa Aceves at illinoistrialteam.vpe@gmail.com. Your feedback is much appreciated! We need your help to turn our collection of handwritten correspondence between anti-slavery activists in the 19th century into texts that can be more easily read and researched by students, teachers, historians, and big data applications. In this project, we’re asking our volunteers to help transcribe Boston Public Library’s extensive collection of handwritten correspondence between anti-slavery activists in the 19th century into texts that can be more easily read and researched by students, teachers, historians, and big data applications. Get involved right now at www.antislaverymanuscripts.org! Echoes & Reflections is the premiere source for Holocaust education and professional development which utilizes the unparalleled expertise and resources from three world leaders in education: the Anti-Defamation League, USC Shoah Foundation, and Yad Vashem, to empower teachers and students with the insight needed to question the past and foresight to impact the future. They offer an array of webinars, which are also free. WWW Virtual Library: International Affairs Resources is a cost-free academic Internet directory that is part of the volunteer-run WWW Virtual Library System, with over 2000 carefully selected, annotated links in 34 international affairs categories. It is frequently maintained, receives worldwide use daily, and is designed for teachers, scholars, students, researchers, diplomats, and the interested public, among others. This Virtual Library would be useful to high school social studies and foreign language teachers. This directory is supported by Elizabethtown College, PA, USA and has recently relocated to https://internationalaffairsresources.com. All external links to any former URLs of this site since 1999 will automatically be forwarded to the new URLs. Users of this Virtual library can identify cost-free, authoritative, reliable, ongoing sources of statistics, information, and analysis in International Studies, worthy of regular consultation, and also benefit from general tips for more effective Internet use in academics and in serious international studies research. Please note the “Tips for Quality Internet Research in International Studies” section on the index page. The site is linked on hundreds of library, university, governmental, military, NGO, and IGO websites, including Oxford University’s Bodleian Library (http://ox.libguides.com/c.php?g=422732&p=2886656) and Sciences Po (http://sciencespo.libguides.com/science-politique/relations_internationales-defense), France’s top Political Science program. With the search term “resources for international relations students,” as well as several others, it is usually in the Top Ten on Google. Individual pages are also well-ranked under their relevant search terms. It was recently noted at http://www.freetech4teachers.com/2017/10/the-www-virtual-library-international.html and www.educatorstechnology.com/2017/10/7-good-new-edtech-tools-to-try-out.html. Professor Wayne A. Selcher, Ph.D. Founded in 2011, The Center for Reflective Citizenship (CRC) is a unit of UTC’s College of Health, Education, and Professional Studies. The CRC is dedicated to the revitalization of civic education in American schools and universities, and the equipping of a new generation of thoughtful citizens for the practice of democracy. The CRC, directed by Lucien Ellington, has an interdisciplinary focus. Learn about our first extensive digital publication for teachers: 2017 Faculty Fellow American History and Government Teaching Modules! Are designed to be taught in two-four hours of class time. For a succinct overview of the ten teaching modules, please see our module digest 2017 Faculty Fellow American History and Government Teaching Modules Digest. The Library of Congress invites you to help us in the effort to take newspapers Beyond Words. Join us to identify and improve information about illustrated newspapers in the Chronicling America digital collection. This brand new pilot project offers you the opportunity to explore historical newspaper coverage of World War I and contribute to Library of Congress collections at the same time. This project from LC Labs is an experiment in crowdsourcing and community engagement. Our goals are to gather more structured and usable metadata about the illustrations, comics, cartoons, and photographs in these newspapers; and to learn how to better connect to people who are interested in our collections. To help us reach our goal -- and to help ensure accuracy -- we've broken the work into 3 free-standing tasks. These tasks follow a sequence, but they can be performed independently. Feel free to focus on the one you enjoy the most! The information that is created through this project is being made available for download as data sets and for exploration via keyword search in the Gallery. Founded in 2007, Global Exploration for Educators Organization (GEEO) is a 501c3 non-profit organization that has sent over 2000 teachers abroad on adventurous travel programs. With GEEO educators can earn professional development credit while seeing the world. GEEO's trips are 7 to 21 days in length and are designed and discounted to be interesting and affordable for teachers. In addition to amazing tour leaders, many of the programs are accompanied by university faculty that are experts on the destination. The deposit is $250 for each program and then the final payment is due 60 days before departure. Big Questions Blog from ICSS member Dan Fouts. This blog celebrates the power of Big Questions. Discover lucid examples of Big Questions and resources that inspire teachers & students. Dan has been teaching high school in the Chicagoland area since 1993 using Big Questions in his AP Government, US history and philosophy classes. Teaching American History.org is excited to unveil another great resource for teachers and students! We’re offering free American History Toolkits to help you teach several major eras and topics in our Nation’s history. Toolkits are topically-focused collections, each made up of resources from around TeachingAmericanHistory.org, and organized to provide for easy access to a variety of materials. Lesson Plans that complement the documents and more! Our whole purpose at TeachingAmericanHistory.org is to provide teachers like you with resources you need to thrive. We hope you (and your students) will find these Toolkits useful classroom resources. Order your FREE American Presidents Timeline Poster! Our free American Presidents Timeline poster is available for order. All orders received by Thursday, August 3 will be processed and shipped next week. This colorful 6' long poster details the lives and public service careers of every president, plus key historical events, Supreme Court cases, Constitutional Amendments, and technology milestones throughout history. To reserve yours, simply visit our Special Offers page, log-in, and click on "Get This Offer." The poster is FREE of charge to C-SPAN Classroom members (* limit of one poster per member and only available to members residing in the U.S. and territories). Already ordered a copy earlier in the spring but never received it? Simply email us at educate@c-span.org with your preferred postal information and we'll get another one in the mail. Last October we asked for your votes and thanks to you we are rolling out the first of several programs for Illinois students! Please take a look at the following information and kindly share the news with K-12 educators and community leaders or consider participating yourself! With the school year approaching, teachers may be looking for opportunities for their students to learn while giving back. Look no more! With your help we were able to secure funding from Farmers Insurance and are pleased to introduce Illinois Waterway Cleanup Week, September 10-16. This week-long initiative provides an opportunity for educators and students all over the state to work together to make an impact on our state's waterways! Community groups, park districts, municipalities and other organizations are also invited to participate so long as youth are engaged! Use the Clean Swell App to record trash-pickup data in real-time! Access data from the 800,000+ people participating in similar cleanups worldwide! Learn how to partner with a classroom doing the same project in another part of the world! contact us at waterwaycleanup@global-illinois.org or visit our website at www.IllinoisGlobalScholar.org. Being a teacher myself, I know there is a lot of interest in service-learning, citizen science, and UN Sustainable Development Goals (SDGs). I also know that many students want to contribute. Please consider participating in Illinois Waterway Cleanup Week yourself and spread the word through social media or by forwarding this email with a personal note attached! Last October, seventh-graders at an Illinois middle school petitioned their school board to change Columbus Day to Explorers Day. Their efforts have led the district to create an Explorers Week so that students can learn about the contributions of many different explorers. 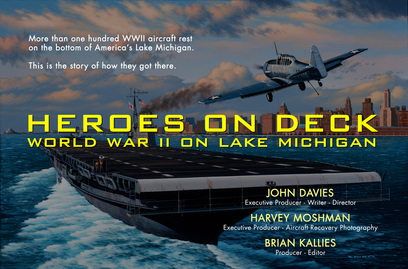 Narrated by Bill Kurtis, this documentary explores the little-known chapter of WWII history immediately following the attack at Pearl Harbor that took place just off Chicago's shores. With enemy submarines patrolling both east & west coasts, Lake Michigan was chosen as a safe place for the location to train more than 15,000 aviators for eventual carrier based duty in the Pacific, including future president George H. W. Bush. Neophyte pilots and unforgiving weather conditions on the lake contributed to hundreds of accidents. As a result more than 100 WWII aircraft sank to the bottom of Lake Michigan. ​There is also have a shorter, 42 minute version that may be more suitable for class discussion time frames. A new series of short videos is being offered free of charge by Bowdoin College as its contribution to a national effort aimed at improving civics education in the United States. Titled “Founding Principles: American Governance in Theory and Action,” the series comprises a total of fifteen episodes, each eleven to fifteen minutes in length, that serve as a readily available instructive tool for use in classrooms and by anyone interested in better understanding the American system of government. Written and narrated by Bowdoin College Government Professor Andrew Rudalevige, “Founding Principles” provides an introductory, non-partisan overview and basic understanding of American government—how it was formed, how it works, and how everyone can participate. The series was produced by Bowdoin with technical support from students at Emerson College. During this pivotal election year, “Founding Principles” serves as a valuable resource in educating and informing current and future voters, building citizen-leaders, and promoting civic engagement. The series is currently being used in classrooms across New England with very positive feedback. We at the college find it invaluable if you would share with your member base via an eNewsletter or on your website so that interested teachers can access it for this upcoming election season lesson plan. We have strong support from DOEs here in New England and teachers are loving this tool. If you could make teachers aware we would appreciate it! Serve on an NCSS Operations CommitteeOperations committees carry out board-mandated operations, duties, and policies, as well as many of the necessary business and organizational functions of NCSS. Operations committees relate their work to Board directives, the long-range plan of NCSS, and the leadership theme of the year set by the Board. They make recommendations to the board and provide advice. You must be a member of NCSS to serve on a committee, serving on one committee at any time. NCSS is committed to expanding participation of underrepresented groups. Beginning teachers, elementary teachers, and minorities are encouraged to apply. Appointments will be made by the House of Delegates in November and NCSS President-Elect in June for terms that will begin the following July 1. "As the decision makers of tomorrow children must understand the consequences of indifference and hate. They must not be bystanders, they must always be proactive and have the courage to speak up and care." Explore the history of the Holocaust by taking an inquiry-based walk through our Karkomi Permanent Exhibition. Investigate the experiences of Holocaust survivors, witnesses, resistors, and rescuers through artifacts and testimony. Analyze the human and moral implications of individual choice, responsibility, and memory through connecting galleries and themes. Discover what influences our decision to act as bystanders or upstanders. Peek inside school lockers to find surprising stories about Rosa Parks, Anne Frank and others who took a stand. Give advice to kids in sticky situations or tell their own stories on video. Make a pledge to be an upstander in their own community. Learn about the power of one voice to take a stand for positive change. Explore how questions of identity, human behavior, community, and culture connect to an introductory study of the history and lessons of the Holocaust. Topics include pre-war Jewish life, the Kindertransports, and post-war immigration. Discover ways to become more actively involved in your local and global communities through hands-on activities in Make a Difference: The Harvey L. Miller Family Youth Exhibition. Learn how identity, social responsibility, and community tie into a discussion of universal human and civil rights and introductory study of the Holocaust, including pre-war Jewish life, the Kindertransports, and post-war immigration. Through hands-on, interactive activities, discover what it takes to care for yourself and others, learn how to speak up for those being bullied, and understand core values of respect, compassion, justice, and citizenship.Develop the strategies and tools necessary to not only identify a problem, but also to identify and overcome any obstacles to solving that problem. This tour option does not include the Karkomi Permanent Exhibition. Opportunity Scholarships to subsidize admission and/or transportation available! In case you could not join us for our January 13th legislative webinar: "Social Studies in the Every Student Succeeds Act," you can view this informative webinar recording at: www.socialstudies.org/advocacy/ESSA_Next_Steps and learn in greater detail about the social studies provisions included in ESSA, and what we need to do next to secure that funding and enable social studies educators to apply. Chronicling Illinois showcases collections and items from the vast Illinois history holdings of the Abraham Lincoln Presidential Library. Chronicling Illinois holds thousands of pages of handwritten diaries, letters, and other texts. While printed texts can be scanned with OCR (optical character recognition) technology to add full text searchability, there’s no such easy fix for handwritten documents. Making these items findable requires time-consuming manual labor to transcribe each item. Our library staff can never transcribe all of these documents, so we are appealing to the public to help out. Through "crowdsourcing" (engaging volunteers to contribute effort toward large-scale goals) this massive archive of historical materials becomes searchable, allowing researchers to seek out specific information quickly, and general users to browse and enjoy the materials more easily. By volunteering their time to help make these materials more accessible, participants can learn new information about past eras while assisting others. Please join us in preserving our past by keeping the historic record accessible, one document at a time. Anyone is welcome to contribute to the site. No special expertise is required. To transcribe documents, all you need to do is create an account by choosing a username and password, then respond to an e-mail message to verify your information. After confirming your information, simply select a document and type what you read, following a few simple directions. Since 2003, StoryCorps has given more than 100,000 Americans a quiet booth and a facilitator to record meaningful conversations with one another about who they are, what they’ve learned in life, and how they want to be remembered. The Great Thanksgiving Listen is its most ambitious initiative to date. Open to everyone, The Great Thanksgiving Listen is a national assignment to engage people of all ages in the act of listening. The pilot project is specially designed for students ages 13 and over and as part of a social studies, history, civics, government, journalism, or political science class, or as an extracurricular activity. All that is needed to participate is a smartphone and the StoryCorps mobile app. Students will be asked to interview a grandparent or elder over Thanksgiving 2015 using the new free StoryCorps mobile app. Participants will upload their recordings to the StoryCorps archive at the American Folklife Center at the Library of Congress. In one holiday weekend StoryCorps hopes to gather more interviews than it has in the 12 years since its founding, and to capture an entire generation of American lives and experiences. is happy to announce our new Self-Paced Course series. The use of primary sources as texts in the classroom is growing. Teachers realize these vital witnesses provide opportunities to motivate students and improve learning. They bring students closer to the people, places, and events being studied and help students improve content knowledge while building skills. Recent trends in standards, such as Common Core, and the increasing use of the Document-Based Questions also promote primary source use. The strong push to use primary sources in teaching history and social studies creates a need among teachers for more information on what they are and how they can be used effectively in the classroom. 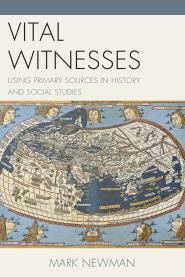 Vital Witnesses meets this need by providing teachers with a comprehensive guide to primary sources and their use in the classroom. Primary sources are defined, and the various types are described. Classroom-tested activities and strategies are offered to teachers for addressing the needs of all learners and for accommodating Common Core standards and the C3 Framework for State Social Studies Standards. The Unfinished Lives Educational Initiative is groundbreaking as it will be the first introduction and discussion of the Holocaust in which Middle and High School teachers can instruct and lead without requiring them to become Holocaust teaching certified. The Teacher Practice Networks Annual Survey is designed to learn from teachers about the types of supports that are helping them implement new state standards, which may be referred to as the Common Core, College and Career Readiness Standards, or something else specific to your state or district. Your feedback will help National Council for the Social Studies in further defining teacher needs as it moves forward in developing College, Career and Civic Life (C3) Framework professional learning initiatives. There are all kinds of great sources to be found under the Education heading. b) Strong Leadership, Public Speaking, Social, and Interpersonal Skills. 1. Free Round-trip international airfare paid by your host school if you teach at the same school for two semesters. 2. Free furnished-apartment usually on school campus. 3. Well-paid positions with free Chinese lessons and paid holidays. b) One-page resume emphasizing your teaching related experiences if any. If you don't have a passport yet, please call your local main post office to apply for one ASAP. As you begin planning your spring lessons: The Illinois Holocaust Museum’s literature-based teaching trunk program provides K – 12 educators with a wide array of resources for classroom units on character education, human rights, the Holocaust and/or genocide. Each trunk allows educators to create meaningful, age/grade appropriate lessons employing award – winning fiction, non-fiction, historical reference materials, as well as DVDs and teaching posters. The focus of each trunk has been carefully developed to address State and National Learning Standards, including Common Core State Standards. Please note: Trunks do not contain historical artifacts or artifact reproductions. *The curriculum framework binder contains an introduction to each trunk; synopses of select books and films with rationale, discussion questions, and activities; additional resources; and professional readings. Reserve Your Teaching Trunk Today! Generously supported by: Bank of America; The Jacob J. Fink Charitable Foundation; J.P. Morgan Chase; Kraft Foods; Motorola Foundation; RBC Wealth Management; State Farm; Bruce and Elizabeth White. Education Services are supported with generous grants from: Dr. Scholl Foundation; Leah Gutman Education Fund; John and Eunice Johnson Education Fund; Harry & Sadie Lasky Foundation; Francis L. Lederer Foundation; Francis L. Lederer Foundation; MetLife Foundation; Charles & M.R. Shapiro Foundation; and an anonymous foundation. Additional endowment support is provided by: The Mayor Richard M. and Maggie C. Daley Education Fund; The Harvey L. Miller Family Foundation Program Endowment Fund; and Teachers Educational Endowment Fund. students rate their lessons as helpful. Best of all, their lessons can reach students across the continent. We encourage you to check out our site, www.learningbird.com, for general information, and to join if you are interested in participating. You can also follow us on Facebook <http://www.facebook.com/learningbird> and Twitter<http://twitter.com/learningbird>. The Illinois Judges Association welcomes opportunities to be in the classroom, including the 7 Reasons to Leave the Party, discussing the legal effects of drinking, and Courtroom in the Classroom, discussing the law through the use of a search of the locker at school case. Information available at http://www.ija.org. Education Portal has 4,600 free, online lessons that you can use to supplement and strengthen your instruction and that your students can use for summer study. We have lessons in social science, history, and more. Don't see your subject area? Let us know and we'll add it to our lesson development queue. NCSS is looking for members to serve on awards selection committees. The selection committees review nominations and select recipients of NCSS awards and grants. Committee members serve a three-year term and most committee work is accomplished online or by telephone. Members are also asked to make a reasonable effort to attend the award winner session, awards presentation, and assist the committee chair when need arises during the review or at the NCSS conference. Outstanding Elementary, Middle Level, or Secondary Social Studies Teacher of the Year awards recognize social studies teachers who have made outstanding contributions through her exceptional teaching in K-6, 5-8, or 7-12. Committee members evaluate nominations and forward the results to the Committee chair. Communications are through e-mail and/or telephone. Members are asked to make a reasonable effort to attend the award winner session, awards presentation, and assist the Committee chair when need arises during the review or at the NCSS conference. Eligibility: NCSS members who are current or previous elementary, middle, secondary level social studies teachers, administrators, teacher education faculty, or consultants are eligible to apply for the corresponding grade level committee. Familiarity with the National Curriculum Standards for Social Studies is desirable. Previous recipients of NCSS or state council teacher of the year awards are especially encouraged to apply. The Award for Global Understanding recognizes a social studies educator or team of educators who have made notable contributions in helping social studies students increase their understanding of the world. Eligibility: NCSS members who are current or previous elementary, middle, secondary level social studies teachers, administrators, teacher education faculty, and/or consultants with a familiarity with the National Curriculum Standards for Social Studies are eligible to serve on the Award for Global Understanding selection committee. Global/multicultural education practitioners or specialists and previous recipients of the award are encouraged to apply. Grant for the Enhancement of Geographic Literacy recognizes an exemplary program of geographic education that encourages the integration of geography into the social studies curriculum/classroom and enhances the geographic literacy of students at the classroom, district or state level. Eligibility: NCSS members who are current or previous social studies educators elementary, administrators, teacher education faculty, or consultants are eligible to serve on this committee. Experience with program, curriculum or teacher evaluation, a background as a geography education practitioner or specialist;and familiarity with National Geography Standards and National Curriculum Standards for Social Studies is desired. reviewers of children/young people literature. The Korematsu Institute (www.korematsuinstitute) wants to send you a FREE Teaching Kit that helps teachers instruct on the life of Fred Korematsu and the overall Japanese American internment during World War II. * the 24 minute version of the Emmy Award winning video, "Of Civil Wrongs and Rights, the Fred Korematsu Story." Start a Rho Kappa Chapter Today! which students will be inducted into the RHO KAPPA Social Studies Honor Society. Availability of classroom materials, posters, multimedia kits, resource boxes and traveling exhibitions will increase our teacher’s ability to bring history alive for our students in our classrooms.